This year marks the 250th anniversary of the Stamp Act, the British Parliament’s attempt to impose on its American colonies a tax on such items as newsprint, bills of lading, legal documents, playing cards, indeed on every piece of printed paper. Britain was in need of money to defray the costs of the French and Indian War which it incurred in defending its possessions in America and fighting the French abroad in what is known as the Seven Years War. Americans resented this tax: it was not a duty on imported goods but a direct tax on items used internally in the various colonies and imposed without their consent. There were many protests which often turned violent. On September 22, 1765, Deborah Read Rogers Franklin, Benjamin Franklin’s wife, wrote from Philadelphia to him in London where he was representing the interests of several colonies. I am so very poor a writer that I dont undertake to say anything about the disorder in this part of the world. But to me it seems we are very wicked and so is the people in London and other places on your side the water. I pray god mend us all. You will see by the papers what work has happened in other places and something has been said relating to raising a mob in this place. I have been to see Mr. Hughes [the designated stamp distributor] who I found a little better and able to stir himself which I know will give you pleasure and the more so as you will hear no doubt how he has been used and by men that better things might be expected from. First to have the bells muffled and send two Drums about the town to raise the mob, and send them under Mr. Hughes’ window; then send messengers to tell him that they was a Coming and would be there in a minute and almost terrify his wife and Children to death; and after this, the man who was at the head of their affair to Complement himself with the merit of preventing the mob from falling on and destroying Mr. Hughes and his whole family. . . . O how I despise such men. . . . The fact of the matter is that Franklin, out of touch with sentiment in the colonies, had at first been accepting of the Stamp Act, and had in fact sought to have some of his friends named as stamp distributors. But when he realized the anger the Act had provoked in America he changed his mind, indeed testified against the Stamp Act before Parliament in 1766, helping to secure its repeal. The above passages can be found on page 5 of In the Words of Women. 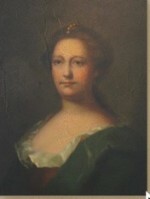 Portrait by Matthew Pratt, circa 1759.